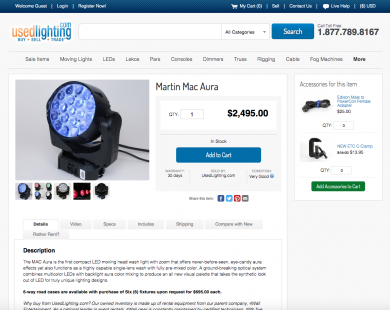 UsedLighting.com As a subdivision of 4Wall Entertainment, UsedLighting.com is an online marketplace where sellers can sell their lighting equipment. We were contacted by 4Wall to redesign their website, add multiple features and a powerful admin section that allows the staff to control every aspect of the selling process. In addition, we created 3 mobile applications that extend the e-commerce experience to the mobile users. 4Wall Entertainment Working with 4Wall since 2008, they contacted us to give us the task of redesigning their core of websites, create a custom system that allows them to manage their web environment and a mobile application for both iPhone and Android as well as email marketing. It is an honor and a privilege working with one of the fastest-growing companies in America, included in the Inc. 5000 list for 3 consecutive years. GC Web Studio has assisted us with websites for both e-commerce and brochure. We also chose them to create our iPhone apps. The GC Web team is adept at blending the functional needs of a website with clean aesthetics that leave a favorable impression with customers and investors alike. In addition to design and programming, we have also used GC for our SEO needs for the past few years. We have had a consistent increase in traffic on all of our websites, and we have been pleased with GCâ€žs efforts to do things the "right way", rather than rely on SEO gimmicks or scams that work momentarily but are not sustainable. In essence, our company found a partner in GC Web who works with us on a consistent basis to create the best media possible. I would highly recommend them to anyone needing help with web design, SEO, email marketing, or mobile apps. 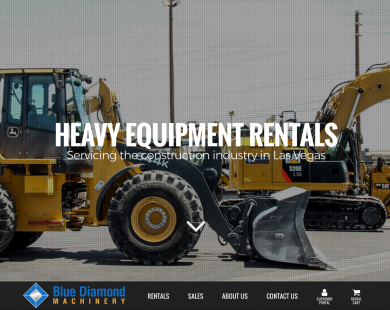 Read More - Wes Bailey, 4Wall Inc.
Blue Diamond Machinery The Blue Diamond team assigned us the task of creating a website and a backend system that would allow their customers to easily submit requests for quotes to rent their heavy equipment. 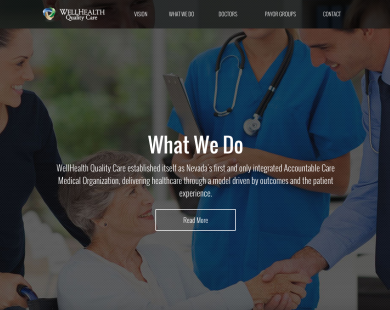 WellHealth Quality Care Redesigned from the ground up, the WellHealth group required a major revamp to their featured website and admin system to keep up with the rapid-changing healthcare industry. Custom graphics, SEO optimized, no templates or Wordpress utilization. Native mobile apps (iOS and Android) interconnectivity as well as direct communication to the MyWellHealth portal. 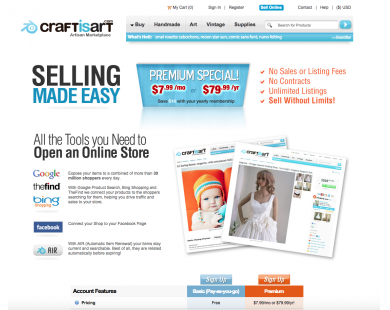 CraftIsArt.com CraftIsArt.com is an online marketplace for worldwide artisans. From handmade artists to supplies vendors, all can list their items with and receive payments instantly. A vast number of tools and payment methods are available to both buyers and sellers. EnPelotas.com EnPelotas.com is an online portal with a powerful multi-language custom CMS (Content Management System) that allows users from around the world to participate as authors, curators and readers. 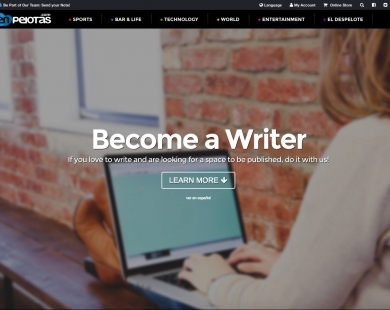 The website has a fully adaptable comments system that works with the 3 major social media networks (Facebook, Google+ and Twitter), an fully featured Online Store and a Publishing platform. 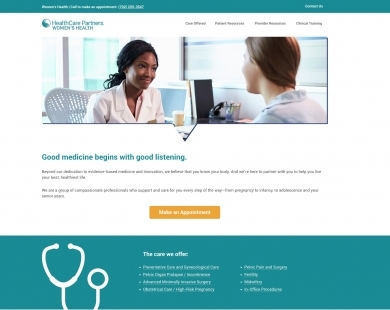 WellHealth Medical Group Complete redesign. 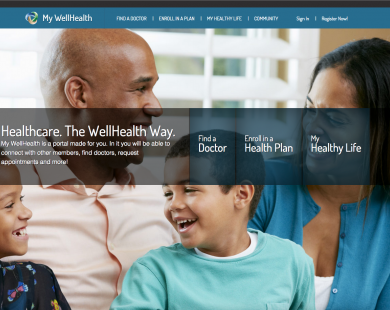 The WellHealth Medical Group needed a website that met the standards of modern technologies. Their team assigned us the task of combining their specialty websites into a single portal to make it easier to manage and provide useful information to their users. 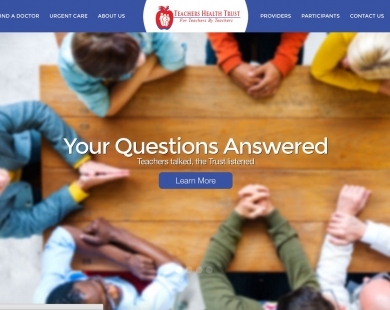 Teachers Health Trust The Teachers Health Trust put is in charge of a complete overhaul of their website. The redesign included a search feature for healthcare providers and specialties. Red Carpet Tango Festival Silvia and Hugo needed to revamp their yearly festival's website so they contacted us to give it a clean and fresh look, and most importantly, make sure their registration system worked properly so no tango dancer was left out. 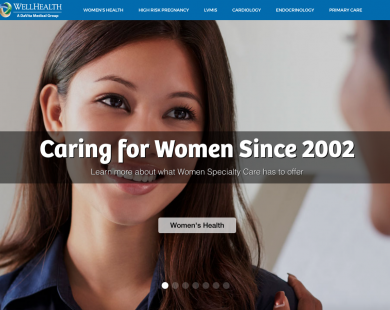 HealthCare Plan of Nevada: Women's Health Working closely with the HealthCare Plan of Nevada's marketing team we completed the rebranding of what once called the WellHealth Medical Group. Dynamex Dynamex is one of the fastest-growing companies in America and we have the privilege of having them as our client since 2009 working on several different projects, from web design to server/systems setup, web consulting, SEO & Marketing. During the due-diligence process for the acquisition of a company in Las Vegas, I was given the task of reviewing their technology infrastructure. I was very impressed with the quality and content of their web site, and later discovered that it was designed and maintained by GC Web Studio. After the acquisition, we engaged Gustavo Campos to make changes to the web site, and were so impressed with his diligence and professionalism that we soon engaged him to handle development and maintenance of our corporate web site, www.dynamex.com. 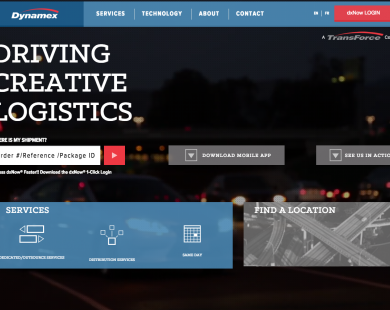 His creativity, responsiveness and attention to detail went a long way to the improvement of the Dynamex web site, and greatly increased traffic flow to the site. I strongly recommend the work of GC Web Studio and Gustavo. Read More - Andrew Pardue, Dynamex Inc. 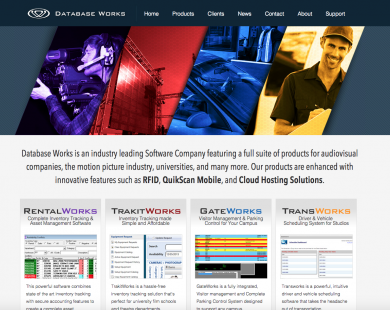 Database Works Database Works is a software company in Brea, California. Terry and his team contacted us to redesign their website completely and work on their SEO and Marketing campaigns. Sales and leads have increased considerably since our partnership began. My WellHealth The WellHealth Group reached out to us with the task of creating a system that enables their patients to find doctors, request appointments, subscribe to insurance plans and much more while at the same time giving their medical staff access to an advanced back-end system to manage it all. The system includes a web portal, two mobile applications and interconnectivity between their group of websites. 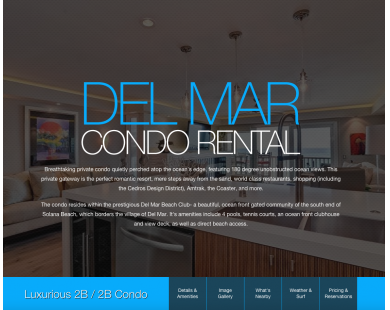 Del Mar Condo Rental The owner of this condo located in Solana Beach, California reached out to us to help him create a website that would allow visitors to view in detail the amenities of this beautiful place. Visitors can request a reservation on real time knowing what dates are available beforehand. 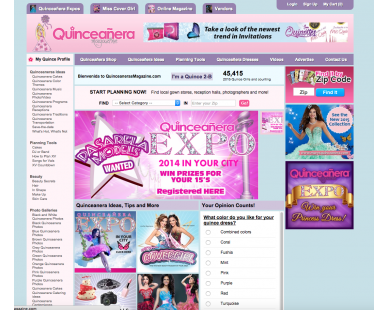 Quinceañeras Magazine Quinceañeras Magazine is the #1 magazine in the United States in its category. Working with them since the magazine was launched in 2006, we created their website along with a fully featured custom content management system to control most of the sections, as well as many other features such as e-commerce, advanced polling systems, SEO, Server Maintenance and much more. 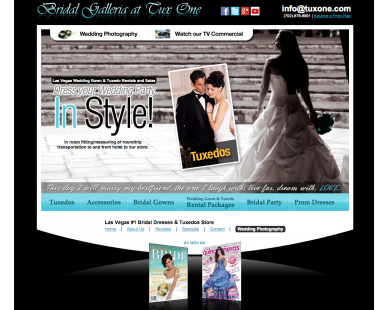 Tux One TuxOne is the Las Vegas #1 Bridal Dresses and Tuxedos Store. Working with them since 2009, we have continuously provided them with our web design adn SEO services, placing them at the top of search engine results for over 6 consecutive years. 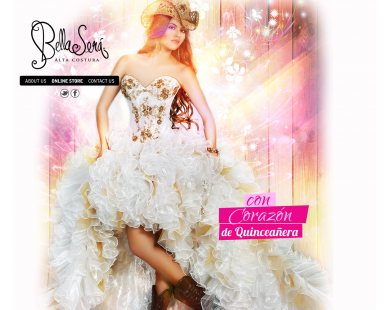 Bella Sera Dresses A subdivision of Quinceaneras Magazine, Bella Sera Dresses is an ecommerce site with a powerful back-end admin section to control the sales flow, store locations and more. Baby Blues Baby Blues is a comic strip that is featured on several different newspapers in the United States. 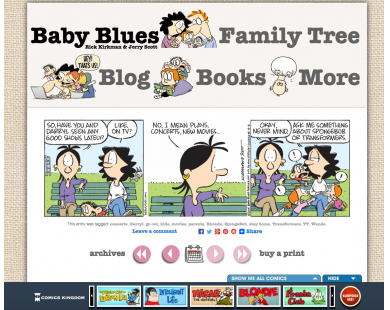 We were contacted by their founders to help them create a custom web application called the Baby Blues Archive that would enable users to tag comic strips based on their content in exchange for rewards. Tagging was important for visitors to find specific comic strips faster. 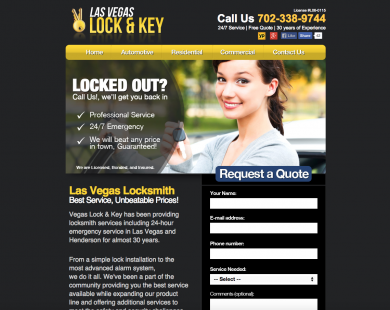 Vegas Lock and Key Vegas Lock and Key is a company that provides locksmith services in Las Vegas. 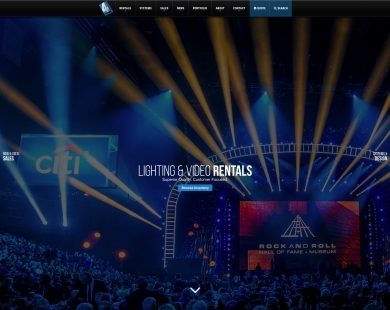 We created their website and manage all their SEO and Marketing campaigns. They currently rank among the top 10 in their category on the 3 major search engines. 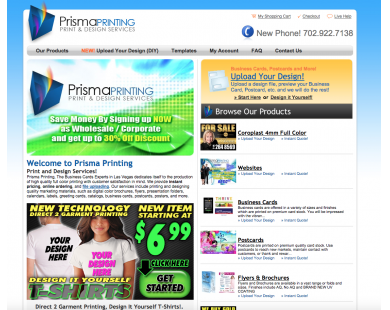 Prisma Printing Prisma Printing contacted us to create their website and their logo along with a Custom Printing system for their customers to upload any design and preview it before placing an order. Customers can also get instant quotes, receive live chat assistance and more! Glamsquadshop Glamsquadshop is a Vegas based boutique that contacted us to work on their website and a custom content management system to manage image galleries and many other aspects of their website. 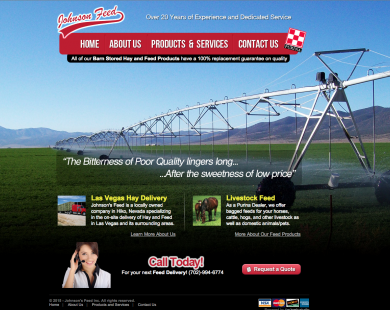 Johnson Feed, Inc. Johnson’s Feed and Hay is a company located in Hiko, Nevada. We were contacted by them to create their website and start an SEO and Marketing campaign. 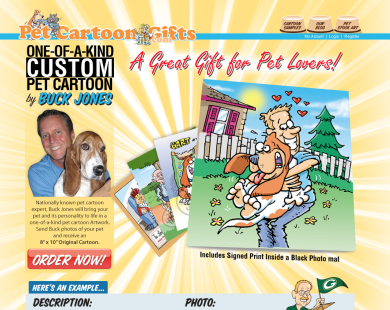 Pet Cartoon Gifts Buck Jones is a successful Humorous Illustrator and Cartoonist since 1988. Buck got in touch with us to help him create a website and a custom web application that allows users to submit a custom request for a fun cartoon of their pet. Users can personalize their cartoon, add custom framing, upload images and pay directly on the website. 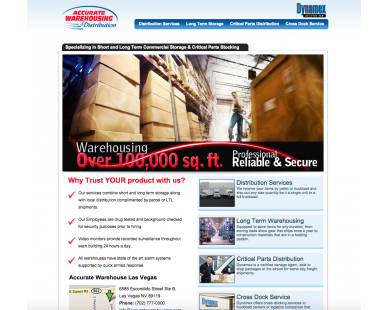 Accurate Warehousing Before being acquired by Dynamex, Accurate Warehousing in Las Vegas contacted us to help them create a microsite that would showcase their products and services. We are also in charge of their SEO and Marketing campaigns. 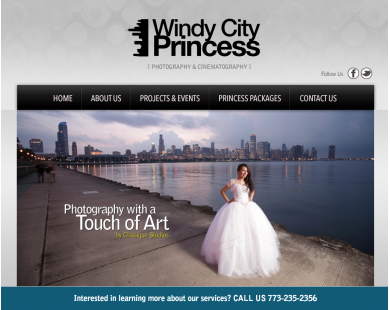 Windy City Princess Windy City Princess is a Photography website with a custom content management system for image galleries and other internal aspects of the website. 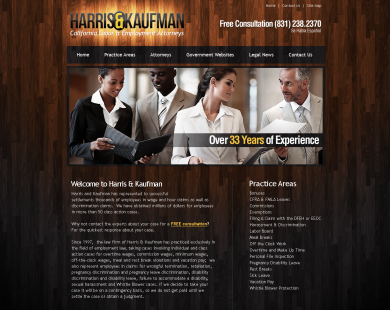 California Wage Attorneys California Wage Attorney William Harris partnered with us to help him create a website and a custom content management system to control key sections of his website. We also helped him with Search Engine Optimization. 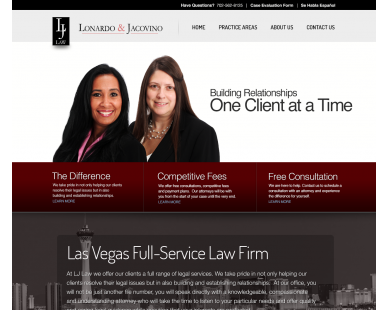 LJLaw Las Vegas Lonardo and Jacovino is a law firm in Las Vegas that requested our web design services to create a website to show their services. 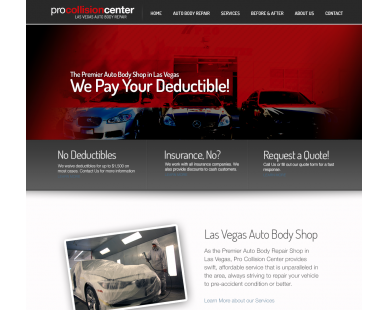 Pro Collision Center Pro Collision Center is a body shop in Las Vegas. They contacted us with the task of redesigning their website and start managing their SEO and Advertising Campaigns.